"Make someone happy, make just one someone happy." What makes this someone happy is an entertaining and informative lesson on musical theater history from James Rocco, Artistic Director of the Ordway and genial host of the Broadway Songbook series. The final show in this third season of the series focuses on lyricist team Betty Comden and Adolph Green, famous for such classic musicals as On the Town, Wonderful Town, Bells are Ringing, and Will Rogers Follies, not to mention such films as Singin' in the Rain. Along with talented local singer/actors Elena Glass, Amasia Gordon, Reid Harmsen, Peggy O'Connell, Carl Shoenborn, Erin Schwab, and Kirby Trymucha-Duresky, and a three-piece band led by pianist and Musical Director Raymond Berg, James presents yet another fun show celebrating musical theater history. There's really no better way to spend a rainy afternoon. The company presents a selection of songs from Comden and Green's first musical, the 1944 classic about three sailors on leave for one short day in NYC, On the Town. Songs include the most famous song from the show, "New York, New York," with Reid, Carl, and James playing the sailors, "I Can Cook Too," with Kirby stepping in at the last minute for an ill Regina Marie Williams, "Carried Away," a very funny duet by Reid and Elena, and the poignant final song, "Some Other Time." The quite fabulous Peggy O’Connell* sings a funny and sad rendition of "The Story of My Life" from Wonderful Town, as well as a hilarious Carol Channing-esque version of "I’m Going Back" from Bells are Ringing. High school student Amasia, whom James "discovered" in an audition for this year's holiday show A Christmas Story, impresses with a couple of solos – "Hallelujah Baby" and "Being Good." Kirby and Erin duet on "Ohio," in which Erin filled in for Regina and cracked her cast-members up, as well as the audience. She's also quite funny in the super-fast "If." Carl gives the villian's perspective in "Captain Hook's Walz," with the cast and audience cheering him on. The choreography is quite impressive; they don't just stand there and sing. Of particular note is the terriffic tap-dancing by Reid and Elena in "Comes Once In A Lifetime" and the fast and fancy red and blue-gloved hand motion for "Our Favorite Song." If you're a musical theater fan, the Ordway's Broadway Songbook series should be required viewing. I love musical theater more than anything but there's so much I don't know about it, and this series helps fill in the gaps in my knowledge. The show takes place entirely on the stage of the Ordway's main theater, meaning the audience sits on stage too, which is a unique perspective. 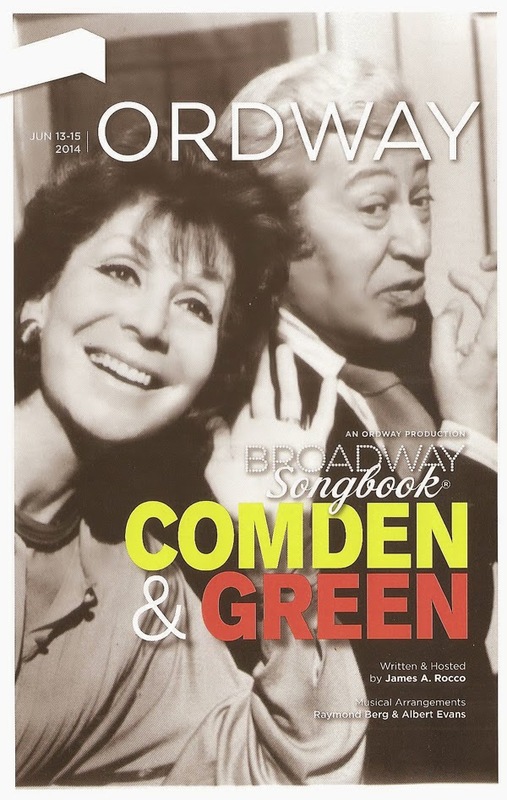 Broadway Songbook: Comden and Green runs this weekend only so act fast. Or plan ahead for the next installment, The First 100 Years, which unfortunately falls right in the middle of the Minnesota Fringe Festival (although on second thought I may be the only person in the intersection of Broadway Songbook and Fringe Fest). *I don't believe I've ever seen Peggy on stage but she seemed familiar to me, and I realized why when I read that she had a recurring role on my favorite TV show of all time, Northern Exposure.